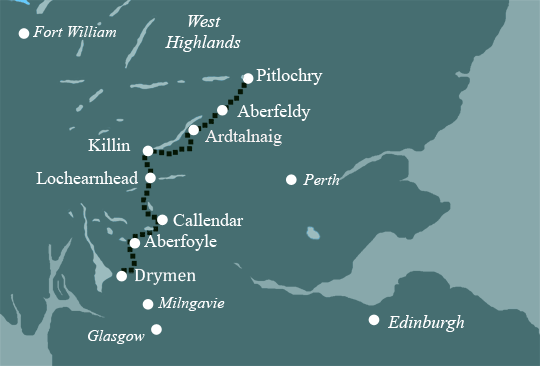 This is our recommended Rob Roy Way walk of 7 days and 8 nights as it allows you enough time to cover the walk at an enjoyable pace and really enjoy the scenery. A pleasant sheltered walk starting on a minor road before entering the extensive Loch Ard Forest and using forest tracks. The route continues on forest tracks until Aberfoyle, the most southerly of the Trossachs villages. A glorious walk through the Menteith hills on forest tracks and stony paths on to Loch Venachar. The last few miles encompass a very quiet minor road into Callander. Callander is a large town with plenty of shops and cafes. You will leave Callander walking by the banks of the river Teith heading into the highlands. You will then follow an old railway line shared with cycle route 7 along the west shore of Loch Lubnaig. Today’s destination is the small village of Strathyre. Continuing north on forest tracks before you rejoin the railway line, today is a varied day with pleasant views over the river and then Loch Earn. You can take an optional diversion to visit Rob Roy’s grave at Balquidder. 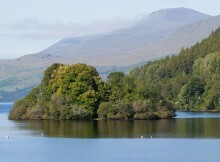 Killin is located at the west end of Loch Tay. If you wish, it is also possible to visit the Aberfeldy Malt Whisky Distillery or the nearby 16th century Menzies Castle. Pitlochry is known for its Hydro-electric dam and ‘Fish Ladder.’ The town also has two malt whisky distilleries. It is also possible to climb Ben Vrackie from here (2757 feet, 841m). By Air: The nearest airport is Glasgow International (GLA) or Glasgow Prestwick (PIK). An airport shuttle bus runs into Glasgow city centre, journey time is 25 minutes. You can then travel by bus (usually not direct) or taxi to Drymen. Glasgow to Drymen is 18 miles. By Public Transport: There is a main railway station in Glasgow; you can then travel by bus (usually not direct) or taxi to Drymen. Glasgow to Drymen is 18 miles. By Road: A811 from Stirling (21 miles) or A809 from Glasgow (18 miles).